A Deeper Look in the Metro Budget: Goodbye $5 Day Passes? The Source reports at Thursday’s Board meeting the Metro Board adopted the proposed fiscal year 2013 budget. This goes into effect July 1st. Frank Shapiro, Deputy Executive Officer, Finance for the agency made an informative presentation on the budget proposal at the March 23rd meeting of Metro’s Citizens’ Advisory Council. While the budget doesn’t include a fare increase for fy2013 it assumes the day pass will go back to being $6 as of July 1, when the temporary reduction to $5 expires. Keeping it at $5 would require a vote of the Metro Board. The one remaining Board meeting before the change occurs will be in late June and we’ll see if they decide at that point to extend the reduced price (plus whether for just another year or longer). Which would entail the finance folks having to engage in some hurried number crunching to get the budget back in balance due to the lost revenue. Many will be glad to know this budget facilitates “extended night service for Metro Rail, increasing the frequency of services on all rail lines and providing additional trips on high capacity bus lines to reduce overcrowding and enhance service reliability” (see p.4 under the heading Improved Service & Programs). I’m looking forward to more details on this. Per a motion of Directors Knabe and DuBois staff are in the coming months to prepare a plan for the creation of a construction coordination office (which sounds like a good idea to me). A late addition (see attachment C) to the budget is the allocation of $35 million to commence construction of Division 13 (for storage and maintenance of buses, located adjacent to the Metro headquarters building), to be funded with 80% Federal Grants and 20% Local Funds. There is a page on the Metro website that describes this project. Back in 2008, I remember reading a report on Metro’s dire need for new bus yards. Recently it was unclear just what the status of the Division 13 project was. From some comments Mr. Shapiro made at the aforementioned presentation I am given to understand Metro management considered options and also mulled delaying the start of the project before deciding to instead commence it in the forthcoming fiscal year. Let us hope construction isn’t too disruptive for the surrounding area, especially the Gateway Transit Plaza. Actually according to the “official” draft minutes the Board did NOT approve the budget. It was carried over. That is because you cannot approve the Knabe/Dubois trailer motion on a consent calendar. Obviously in the chaos that is a normal MTA board meeting, Hymon probably thought the approval of the consent calendar meant that the budget was approved. It normally would be, but the Board Secretary knew what was going on. calwatch, thanks for the clarifications. So the Board has until the end of July to keep the day pass at $5. “the chaos that is a normal MTA board meeting” — reminds me why I stopped attending years ago. A spectacle I could no longer stomach. It looks like someone had paid attention and decided to change the minutes to reflect that the budget did pass. Cute. Changing the peak hour 10 minute headway on the Red Line to a 15 minute headway may work for this heavy reail line, but it would not work for the Orange Line BRT. The Orange Line is currently at a 4 minute headway during peak hours partially due to the bus capacity is less than the amount of passengers that have arrived from the North Hollywood Red Line station. This BRT line headway does not stay at four minutes apart as the lighter loaded second bus will catch up with the first bus that has the bulk of the passengers from the Red Line. Changing the Red Line to a 15 minute headway at peak hours would increase the amount of passengers waiting for a Orange Line bus at one time. Which means that some people wanting to board the bus will have to wait another fifteen minutes and have to deal with trying to get on the next bus with another load of passengers that have exited the Red Line station. It just simply would not work. This scenerio has occasionally happened when a four minute headway bus does not arrive and then its not a enjoyable scenerio to see more people than can get on the bus two times in a row. Sorry that came out wrong… the “10 minute headways” was intended to refer to the “more trains more often” evening promotion. Go to 15 on all rail lines, Orange, and Silver during the evening hours, instead of 20 or 30. Peak service should be scheduled as is. I edited the post above. 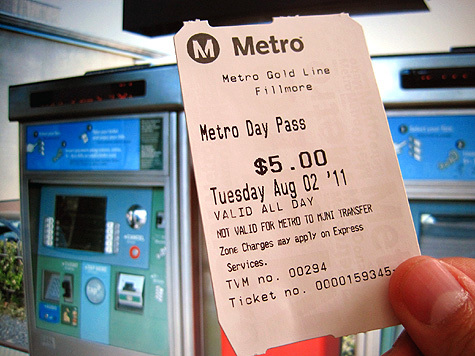 Does anyone here know what it would cost Metro to retain the $5 day passes? It’s not just about saving a dollar, it’s beautifully simple and straightforward to pay with one bill.